I play with an electronic folk / rock outfit, and we tend to wear daft outfits, and have ridiculous stage props. 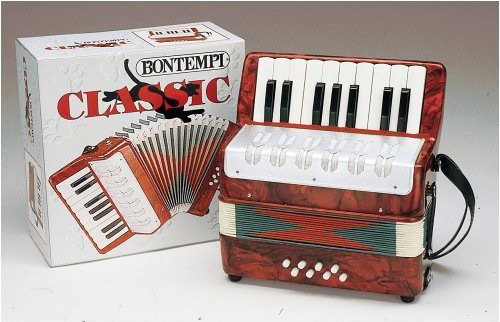 With this in mind, and also wanting a new challenge I decided it would be a good idea to build a working, but silly electronic melodeon for the Summer of 2009. 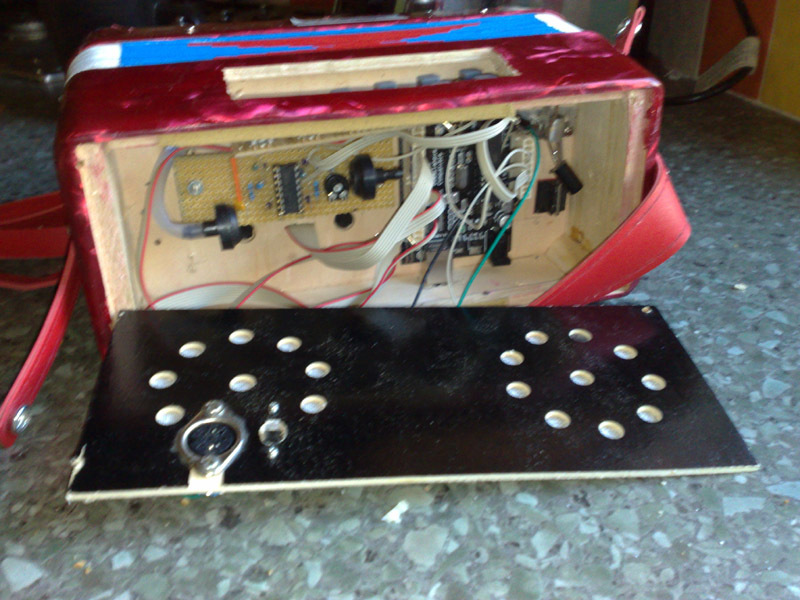 Now, for more serious use, Steve at Streb already makes some very professional electronic melodeons, but I decided to do it on the cheap, and learn a bit in the process. Initially I based the development around a PIC microcontroller, as I'd had some exposure of developing on this around 7 years ago. However having literally got the kit out of the attic and blown the dust off, I found starting from scratch in PIC assembler to be a bit tedious. I'd heard a lot about the Arduino platform on the net, and decided to give that a go. It was very easy! This was literally 30 pounds from Amazon - quite cheap! I gutted all the keys, reeds and supporting hardware from it and was left with just the bellows and frame ready for the electronics! The final touch (not shown in the photos above, but in the video at the bottom) was some pearl-effect shirt buttons. So quite simple in that the ardunio simply gets the differential pressure signal (one sensor = ambient reference, the other goes into the bellows via a tube) into a single A/D channel. Keys are scanned as one set of 6 x 6 (6 outs for columns, 6 ins for rows). 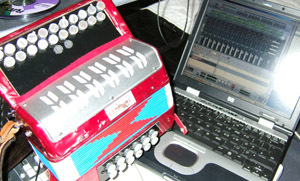 The original intention was to keep the USB for programming / debug, and output via midi. However the UART on the arduino is shared with the USB, so it gets cumbersome to connect / disconnect the USB during use etc. 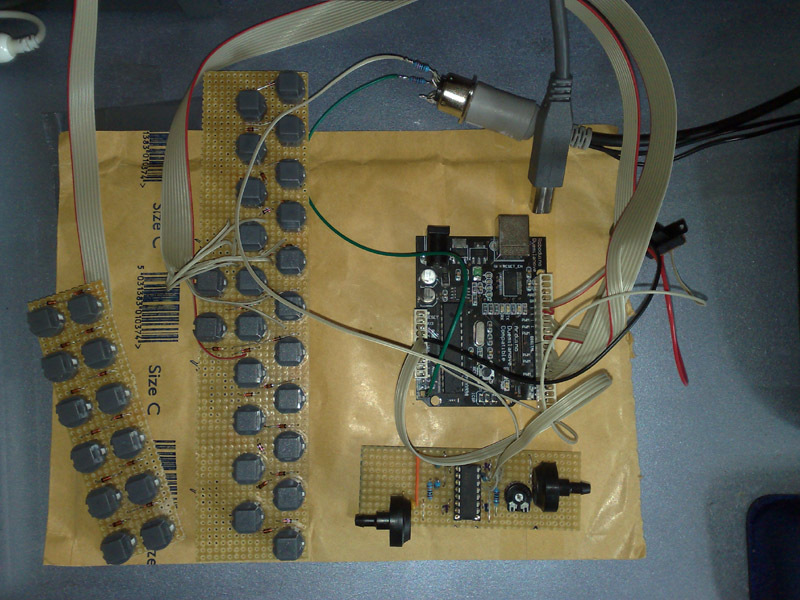 Instead I found the excellent 'newsoftserial' library which allows creating a software uart on any i/o pins. 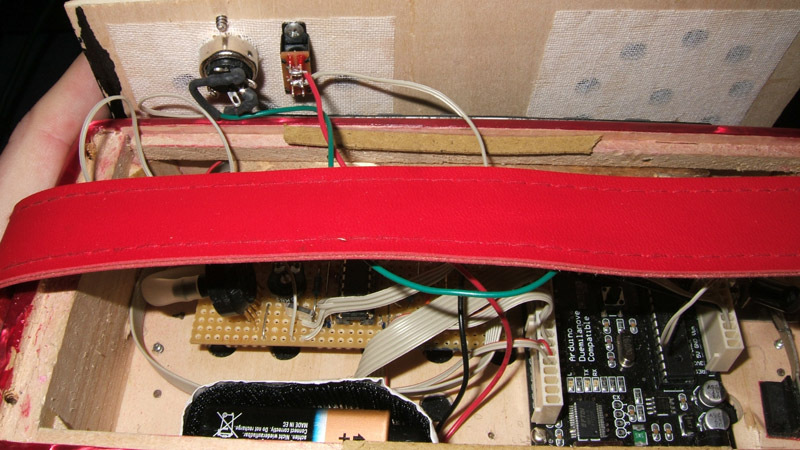 So I put midi on one of the spare A channel outputs, and kept USB for debugging info etc. Later on I decided that as my laptop didn't actually have a midi port, i'd send midi data via the USB connection (after ironing the kinks out of my code). I found a Roland serial to midi loopback driver (as the USB device appears as a serial port) so that all i need is a USB cable to my laptop and it gets power, and midi data back in return - what could be simpler! I have used this live and it works a treat. So basically you can have the choice of fully-contained MIDI output powered from a 9V battery, or powered via USB driving a laptop. Most of my problems were mainly software - the hardware actually came together surprisingly easily. I had trouble with the various analog driven state machine type stuff, e.g. 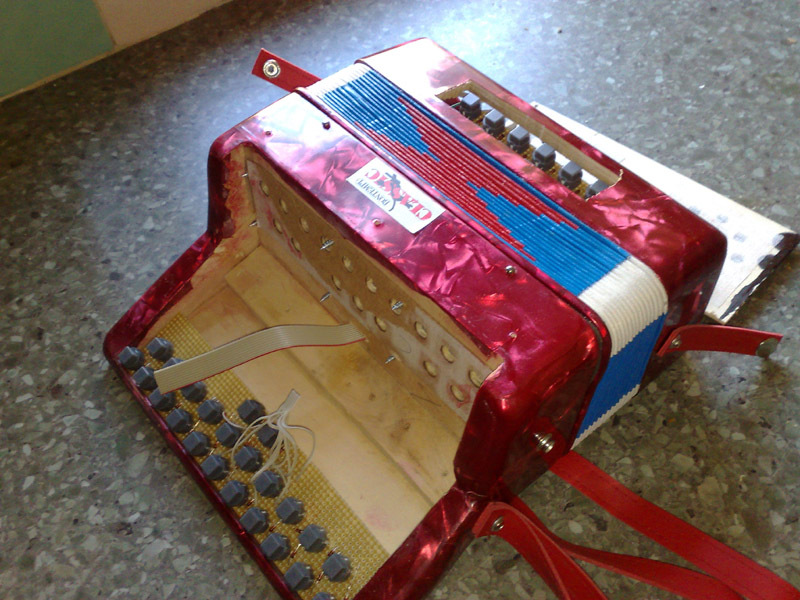 with being a melodeon you get different notes depending on the bellow direction, and if you're holding keys down while changing you have to keep arrays of what's active in order to send note offs before turning on the new notes etc.. all gets quite complicated with the various permutations of what can be happening and what can happen next etc - but I got it sorted in the end. Pressure sensitivity was also a bit of an issue as you can either trigger a note with midi velocity or send volume continuous controller messages. I ended up with a combination of both. All the software was self-written, other than the NewSoftSerial. It was a fairly standard program loop with routines to perform the key scanning (which included a triple-read routine for key debouncing, ie read 3 times and decide if it was more on than off - worked quite well), reading/averaging the bellow pressure, sending midi notes - nothing out of the ordinary really. 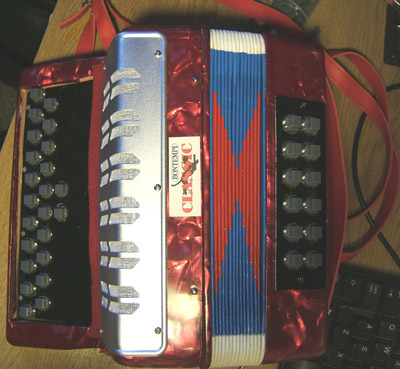 There was also processing of the two 'function' keys, which you can select in software to be +/- 1 semitone transposition (so a melodeon in any key!) or simply to send program change up/down to your midi device. Live I use it straight via USB into my laptop, where I run Reason and anything from sample playback to realtime analogue modelling.